China Golf Cart manufacturer, Utility Vehicles, Electric Hunting Buggies supplier - Suzhou Eagle Electric Vehicle Manufacturing Co., Ltd. Golf Cart , Utility Vehicles , Electric Hunting Buggies , Electric Sightseeing Bus , Golf Car. Golf Cart, Utility Vehicles, Electric Hunting Buggies manufacturer / supplier in China, offering Hunting Car, Electric, 4 Seat, CE Approved, Eg6042A, Electric Golf Cart, 6 Seats, Eg2068k, CE Certificate, Hunting Car, Electric, 6 Seat, CE Approved, and so on. Main Products: Golf Cart , Utility Vehicles , Electric Hunting Buggies , Electric Sightseeing Bus , Golf Car. 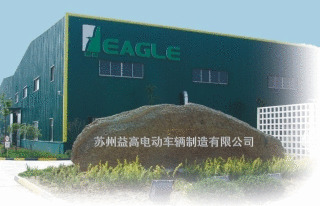 Founded in 1999, Suzhou Eagle Electric Vehicle Manufacturing Co., Ltd. is a leading manufacturer specializing in designing and manufacturing 4-wheel electric vehicles. Our company has a workshop area of 30, 000 square meters and 400 workers. Our current daily production capacity is 100units per day, this can be adjusted with the order volume increasing.